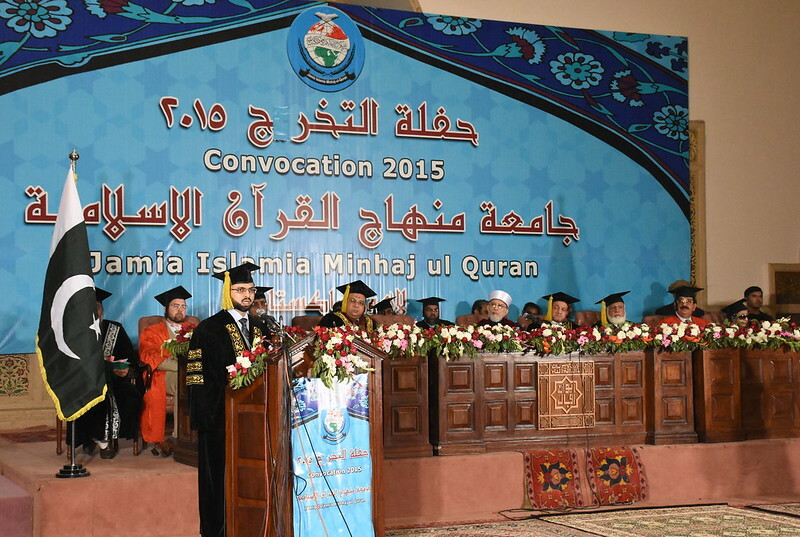 The fifth Convocation of Jamia Islamia Minhaj-ul-Quran was held at the Aiwan-e-Iqbal in Lahore on December 27, 2015. Shaykh-ul-Jamia and founding leader of MQI Dr Muhammad Tahir-ul-Qadri presided over the ceremony, whereas Shaykh Dr. Muhammad Abdul Sattar al-Jibali Imran (Head of the Deptt. of Shariah and Law, Jamia Azhar, Egypt), Shaykh Dr. Muhammad Abdul Raheem al-Buyumi (Principal, College of Usul al-Din & Professor of Theology and Philosophy, Jamia Azhar, Egypt), Dr Hassan Mohi-ud-Din Qadri (Chairman MQI Supreme Council), Dr Hussain Mohi-ud-Din Qadri (vice Chairman of Board of Governors of Minhaj University), Nawab Ghous Bakhsh Barozai (former Chief Minister of Balochistan), Afzal Hayat (former Chief Minister of Punjab), Mian Imran Masood (former Education Minister), Registrar of the Minhaj University Lahore Col. (r ) Muhammad Ahmad, Controller Examination Dr Shujaat Khalid Mahmood and Salman Abid (senior analyst) were the special guests on the occasion. 360 students were awarded degrees in the Convocation. Special shields were given to Shaykh Dr. Muhammad Abdul Sattar al-Jibali Imran (Head of the Deptt. of Shariah and Law, Jamia Azhar, Egypt), Shaykh Dr. Muhammad Abdul Raheem al-Buyumi (Principal, College of Usul al-Din & Professor of Theology and Philosophy, Jamia Azhar, Egypt), Dr Hassan Mohi-ud-Din Qadri (Chairman MQI Supreme Council), Shaykh-ul-Hadith Prof Muhammad Miraj-ul-Islam, Prof Dr Muhammad Nawaz Zafar, Mufti Abdul Qayyum Khan Hazarvi, Mufti Raghib Hussain Naeemi, Vice Chancellor Minhaj University Dr Aslam Ghouri, Principal FC College Dr Charles M. Ramsey, Mufti Arshad-ul-Qadri, Khurram Nawaz Gandapur, Dr Faizullah Baghdadi, research scholar Muhammad Farooq Rana, Dr Mumtaz-ul-Hassan Barvi, Dr Khan Muhammad Malik, and Principal Minhaj College for Women Dr Samar Fatima on their excellent educational contributions. Addressing the participants of the Convocation, Dr Muhammad Tahir-ul-Qadri said that character and knowledge are our identity. He said that teaching is neither a profession nor a business. He said that acquisition and propagation of knowledge is the command of Allah Almighty and favourite Sunna of the Holy Prophet (peace and blessings be upon him). He urged the male and female students to get engaged in efforts for acquisition of productive knowledge. Shaykh-ul-Islam said that the rulers of earlier times would spend their spare time reading books and enjoying the company of the saints and the leaned men after discharge of their official duties. He added in the same breath that the situation has become the other way round today. He said that knowledge, honesty and nobility are no more any criterion to become members of Parliament or aspire for position of authority. He said that the Muslim world will have to resort to research and knowledge creation in order to regain their lost glory and prestige. Dr Qadri said that the Holy Prophet (peace and blessings be upon him) not only persuaded his followers to acquire knowledge but also patronized such activities. He said that the prisoners of war could win back their freedom by teaching the Muslims how to read and write during the Prophetic period. He said that Allah Almighty gave superiority to human beings over other creations owing to their capacity to learn knowledge. He asked the youth and the students to focus on their moral edification and excellence of character in order to convert non-productive knowledge into productive knowledge. Shaykh Dr. Muhammad Abdul Sattar al-Jibali Imran, Shaykh Dr. Muhammad Abdul Raheem al-Buyumi, Dr Hassan Mohi-ud-Din Qadri, Dr Mumtaz-ul-Hassan Barvi, also addressed the Convocation. Hammad Mustafa Madani received the special field Jamia Islamia Minhaj-ul-Quran gave to Dr Muhammad Tahir-ul-Qadri. Shaykh-ul-Islam Dr Muhammad Tahir-ul-Qadri's speech in #JamiaMinhajConvocation underway.